It’s hard to believe Christmas is already here! My, oh, my, 2014 has just flown by. 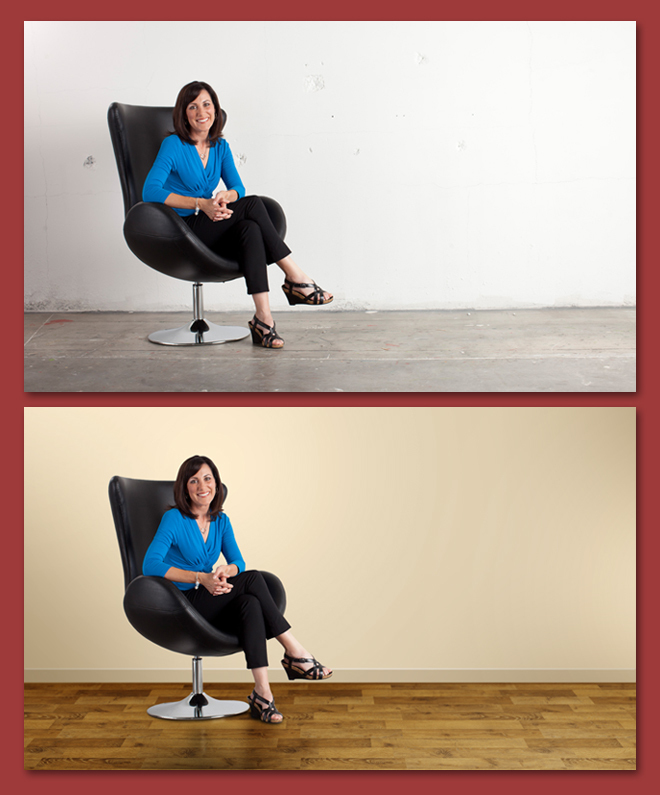 …and below is the printable version. Should you decide to print it, make sure to print it at actual size. Once you’ve printed it, fold it in half from left to right, and then again from top to bottom. Usually, I would have printed this out and sent it out. Regrettably, circumstances beyond my control kept this from happening this year. Oh well, there is always next year. I’ve alluded to an upcoming book cover several times over the past couple months. Now I can speak of it directly. 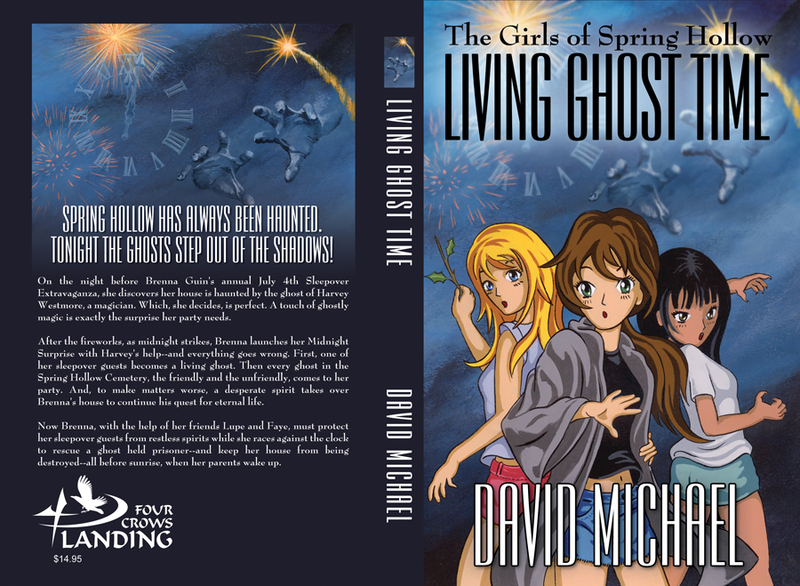 I’m proud to announce the release of the book Living Ghost Time by David Michael – the cover of which was created by yours truly. 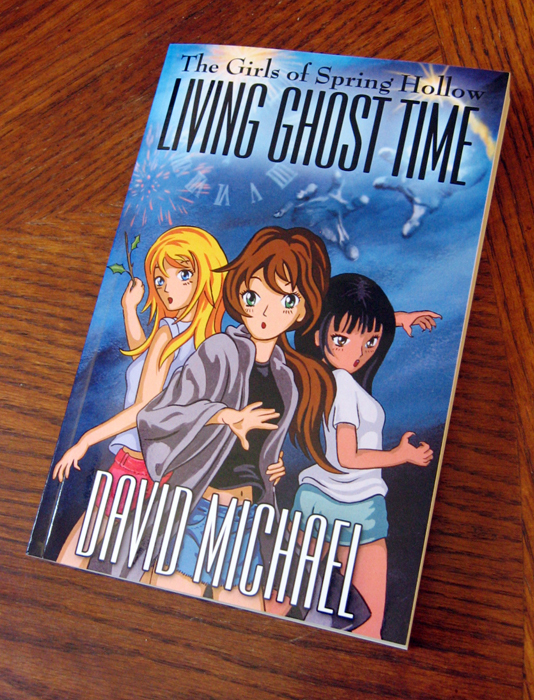 Living Ghost Time – Written by David Michael – Cover Art by Don Michael, Jr. This is Book 2 in The Girls of Spring Hollow series which is geared towards middle-grade/tweenagers and up. You can read more about it – and find out how to purchase it – here. 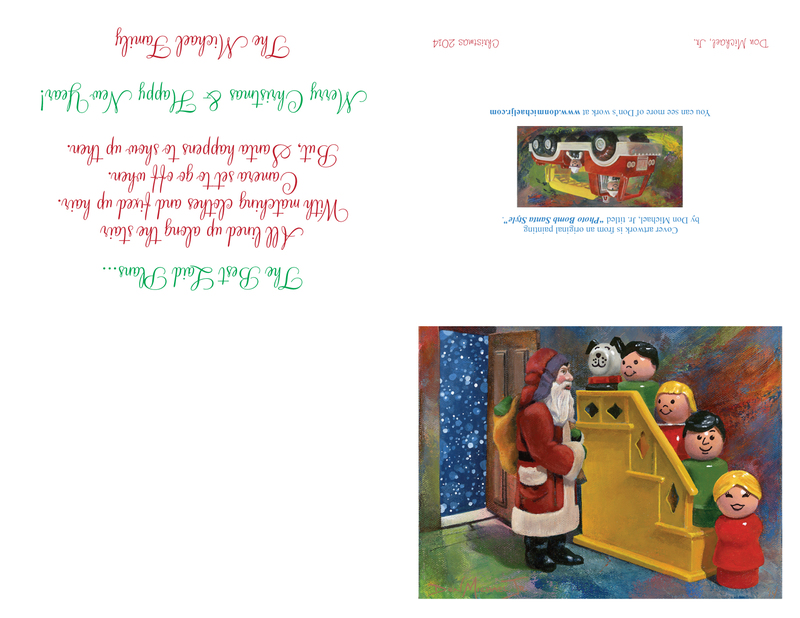 After scanning the painting and then manipulating it a bit, I came up with the book cover artwork. After approval from the author, this is what gets sent to the publisher. All that was left at this was waiting on the finished results. One of the really exciting things about this thing I do is seeing the finished product for the first time. I tear into that box with the fervor of a child on Christmas Morning – every time. And then I can’t wait to show everyone around me – probably with a stupid grin stuck on my face (but I guess that’s just one of the hazards of this occupation). 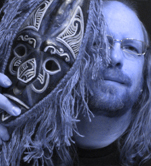 Now it’s time to get back to my studio where I have two totally different mask projects going on, as well as a painting. Fun times! The UNLV Foundation hired my good friend, CJ’s, company Alley Zoom Productions to create a Thank You video to send out to all their donors. I am greatly honored that CJ included me in the creation of this project. As we shot video, we got to see ‘behind the scenes’ of a dynamic and vibrant campus that has faculty and students making a difference upon the world in which we live. We got to meet many students and faculty and learned a lot about what they are up to. We were invited into their classes, labs and training facilities where all of this magic is going on. Let me add that after seeing everything UNLV is doing and is involved in it makes me even prouder that one of our sons is currently attending there (he even appears briefly in this video). 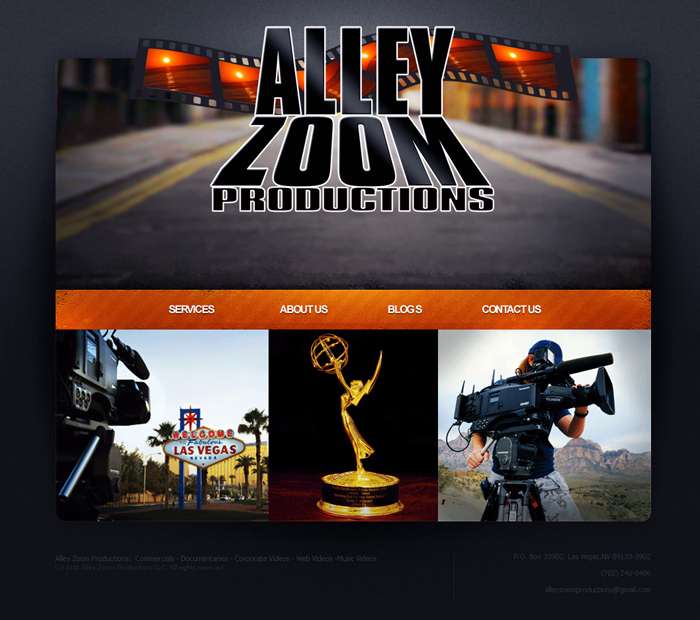 This week a good friend of mine got her new website up and running. I’m proud to say I had a little something to do with the final look of her beautiful new site. 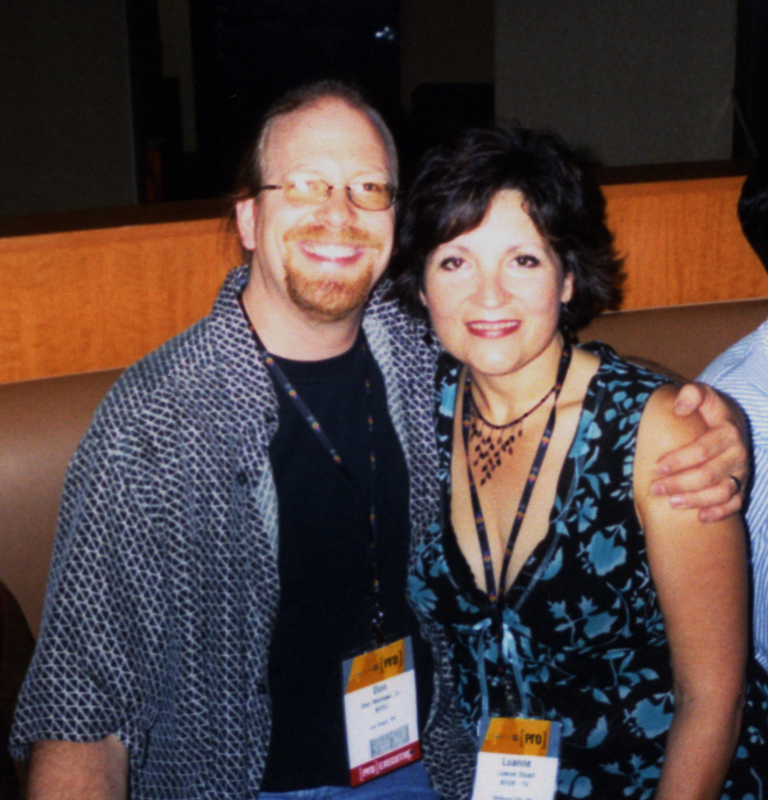 Before I joined in on the fun, Nina and her web creator, Kathy Hicks of Signature Digital Designs, had already figured out the layout and basic look of the site. 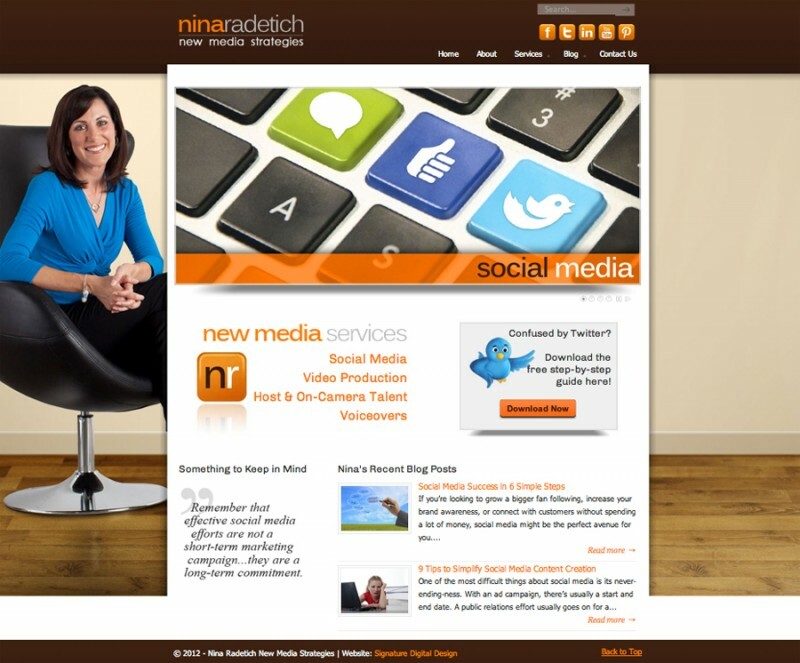 What Nina asked me to do was to come up with graphics and icons to help illustrate her services. I was happy to do just that… and even a bit more. The first thing I did was create a chiclet-style logo for Nina. Then it was time to create the slides for her home page. Nina chose several photos that she liked from a stock photo company. I then did a little pixel magic to tie them all together visually. On Nina’s homepage these all play in a slide show. The rest of this project involved creating several icons to be used on different pages. You can see all those icons by clicking around in Nina’s new site. Check it out by clicking here. For now, I’ll revel in the satisfaction of a completed product for which I am quite proud. I’ve not touched a brush or paint since my Acrylic Painting Class this past Saturday. Instead, I have been reorganizing my studio a bit. Due to a long-running set of circumstances, all of my art books had been relegated to storage for a while. I was missing them tremendously, so I am in the process of getting them out and onto some shelves. Needless to say, there’s a lot of perusing going on at the same time, which seems to slow down the process. 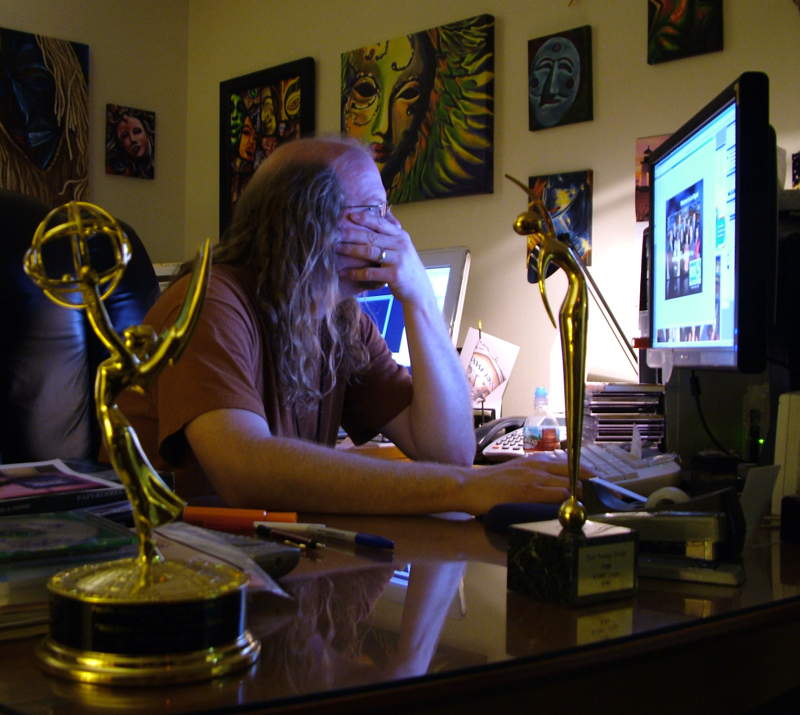 Many of my long-time blogging friends may remember the photo below that my good friend, CJ, took of me back in 2008. 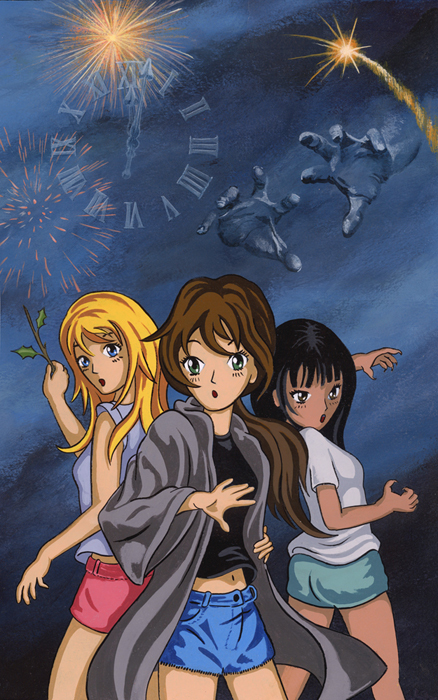 The story begins in a totally different TV station on the opposite side of the country. I was at the tail-end of a 3 year contract with a station that never could get a sense of who they were. I’d already changed the graphics package 4 times and was in the process of creating a 5th package. This time I was also working on a new logo, which I’d been wanting to do from the beginning. During the process, a new Creative Services Director (my direct boss) was hired (the third during my 3 year tenure). Before I had a chance to finish the logo and before I even had a chance to get to know my new boss, she decided that the company would not be renegotiating my contract. Now, this came as a total shock to me – here I was in the middle of creating a new look and brand for the station and it was being RIPPED right out of my hands. Needless to say, all work on that new logo ended for me on that day. The design I started was finished out by someone else. I never claimed any part of it because the final result was nowhere close to what I was going for. I left that company afraid that I’d never get another chance at creating a station logo, which is really a rare opportunity. Now we’ll fast-forward almost 3 years. 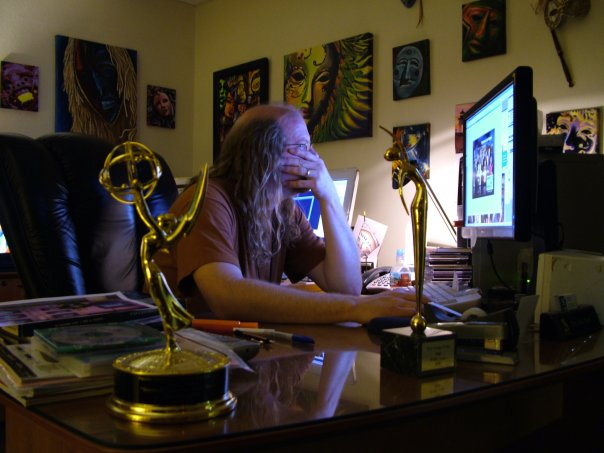 During that time I had accepted the Art Director position in a TV station over 2000 miles away. Immediately upon starting at this TV station I was given the task of redesigning the graphics package. Thankfully, they also gave me the responsibility of designing a new logo. What makes this a big deal is that rarely is a new station logo created in-house by the local art director. 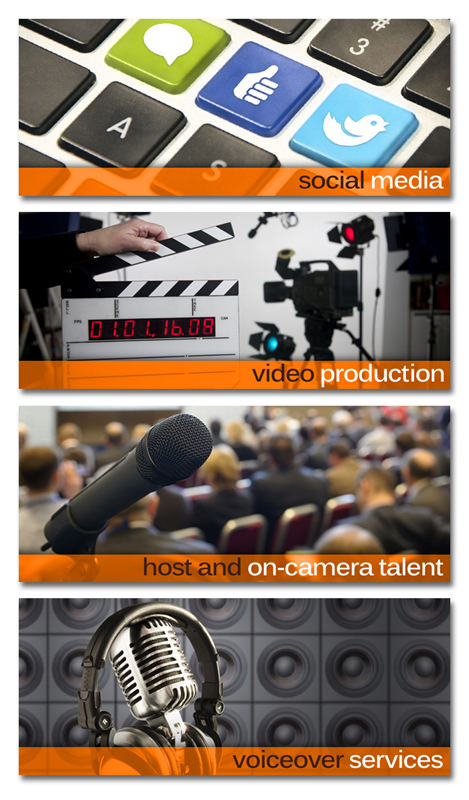 Usually it is ‘farmed out’ to companies that specialize in creating logos and graphics packages for local affiliates. Upon rolling out the new logo and graphics package we immediately started implementing it into our promotions projects, as well. Then, the new logo, the accompanying stationery (that I also created), and some of our promotions projects were submitted for award consideration by Promax (Promotions Managers Association) and BDA (Broadcast Designers Association). These are both international organizations that represent pretty much the entire creative side of television. Every year both organizations jointly hold a huge convention where marketing, promotions, graphics and other creative managers from all over the globe spend 3 days together reveling in the love of what they do, which culminates in huge awards ceremonies for both BDA and for Promax. Ben is holding the trophy that Dale and I won together. (Regrettably, Dale didn’t get into this photo, because I think he took it for me.) You may notice a shoulder on the right side of the photo in the background. I had not noticed before the photo was taken, but upon turning around I discovered that my really good friend, Lu – who is also one of my longest-tenured relationships in television – was sitting there. I immediately went over and plopped down with her so we could celebrate my moment together. Silk Artist extraordinaire, Deborah Younglao, recently decided to revamp her blog and website. While doing so she decided it was the perfect time to create a new logo as well. During the process of creating her logo she posted what she had done so far and asked for input from her blogging friends. I felt she was well on her way to a good looking logo but had a couple suggestions for her which she accepted graciously. I think she came up with a fantastic logo and am proud for my minor part in its inception. You can see what she had to say about the process of creating her logo, as well as some lovely words about yours truly, by clicking on the finished piece below. Thanks, Deborah, this was fun. 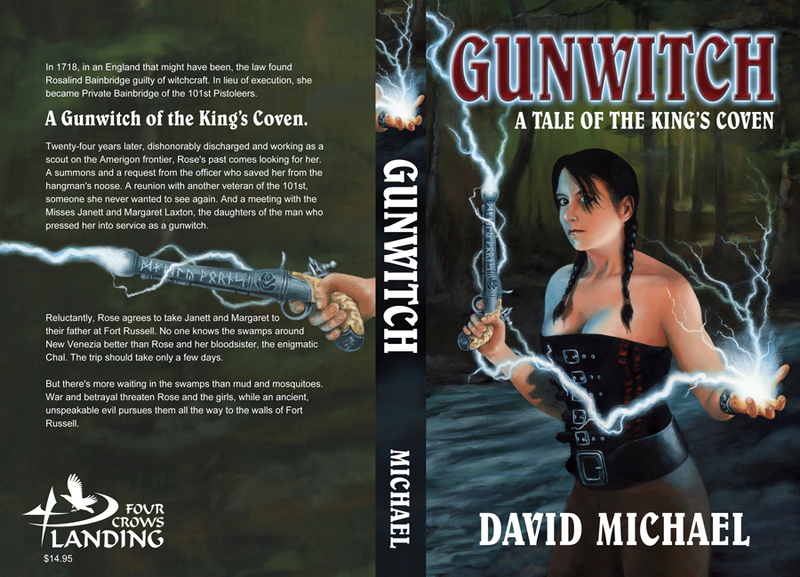 ©2011, David Michael & Don Michael, Jr.
I’m really proud to admit that yours truly is the one guilty of creating the artwork for the cover. It was a fun and challenging project – just the way I like ’em. One of the perks of working with David on these book covers is that I find myself painting images I might not have attempted otherwise – which often informs later works of my own. 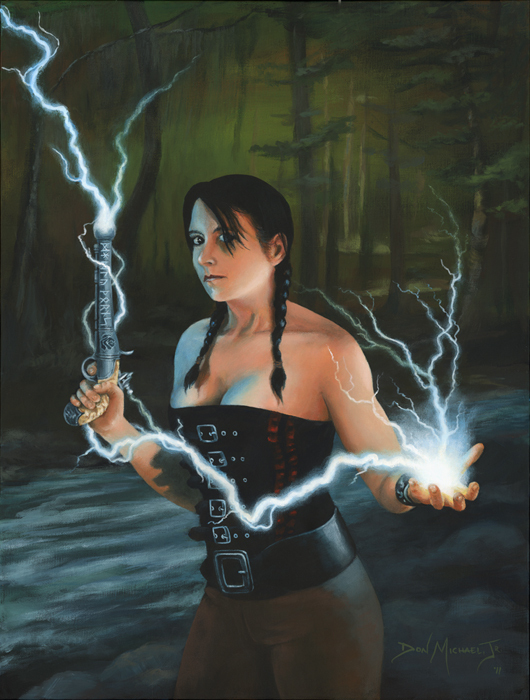 Some of my friends may recognize the hand holding the ball of lightning from when I teased about it back in August. Now that David has released the book, I can finally unveil the rest of the painting. To make this project work I needed a great model, and I found one. She’s a little shy, so I’ll not reveal who she is, but I would be remiss not to thank her publicly anyway. Bless you, my friend! Now I’ve got a painting in the works which involves a different friend as a model. I’d better head to the studio and get busy because I want to have it finished by the end of the week. 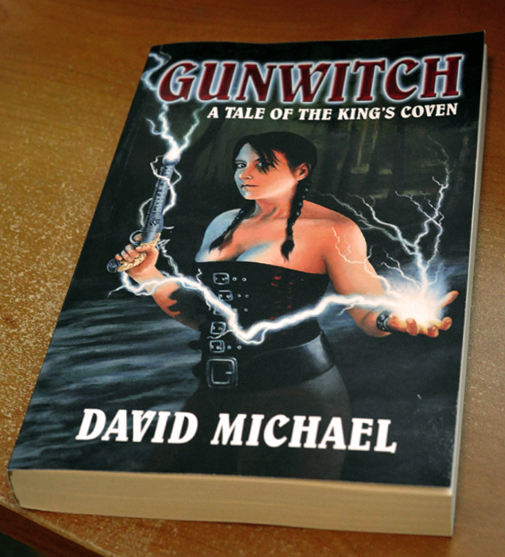 As many of my regular blog friends will recall, my brother, David, is quite the author. He has released several books and short-stories – both paperback and electronic – over the past few months. Below are three of the recent releases and the covers created by yours truly. If you click on the images you’ll see a larger version. If you click on the title below each you will be taken to its corresponding Amazon.com page. 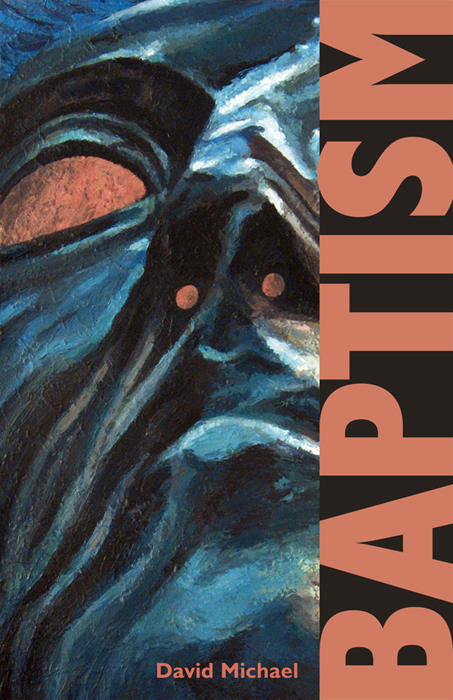 Baptism – by David Michael – Cover Art by Don Michael, Jr.
Serene Morning – by David Michael – Cover Art by Don Michael, Jr. 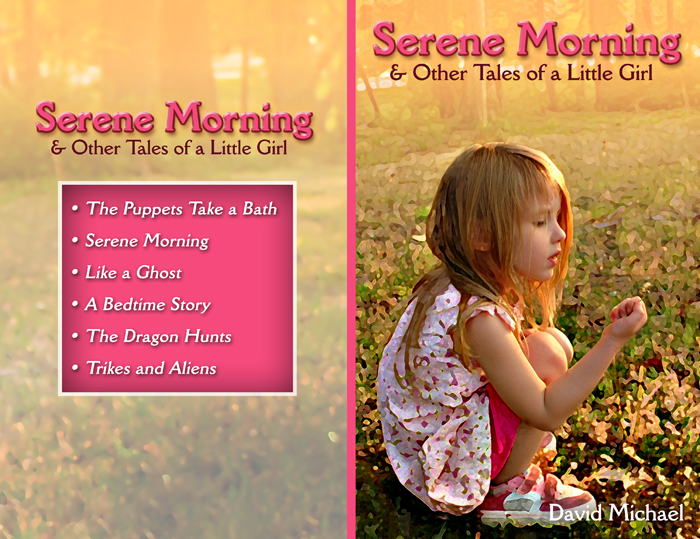 The image on the cover of Serene Morning comes from a photo that David took a couple years ago. (In case I haven’t mentioned before, David is a pretty dang good photographer as well. Check out his photo blog sometime.) 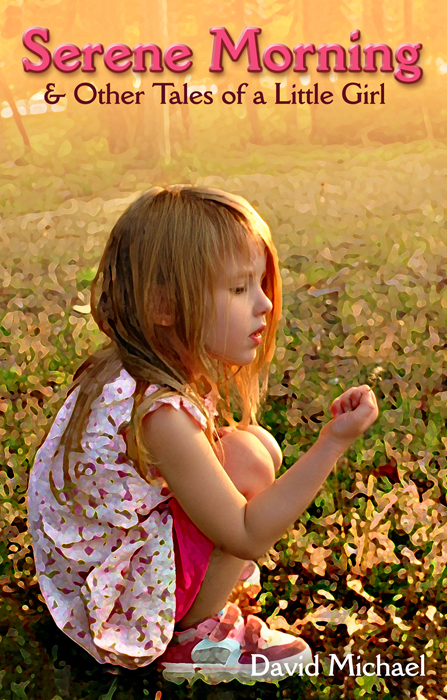 I manipulated the heck out of that photo, but couldn’t find it in myself to touch that beautiful little face. 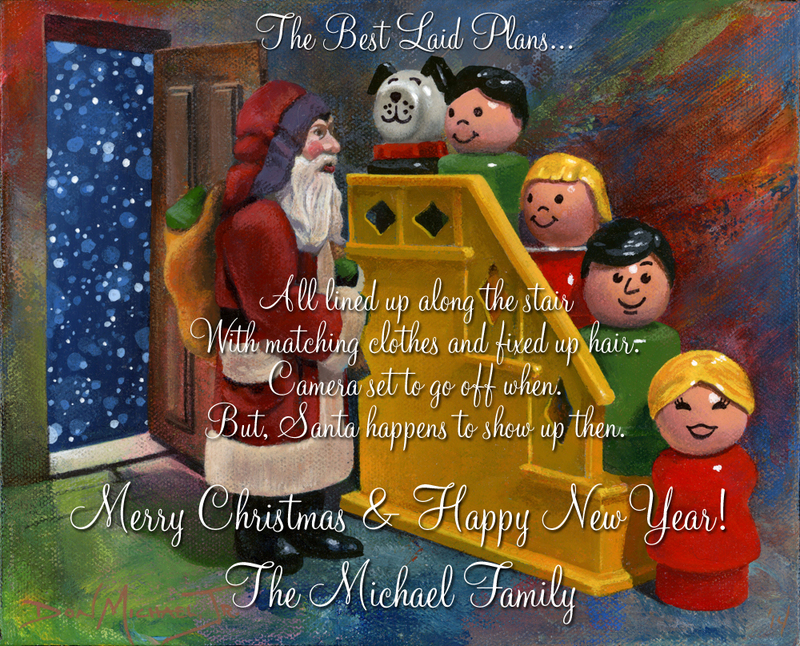 Nasty, Brutish & Short Short – by David Michael – Cover Art by Don Michael, Jr. 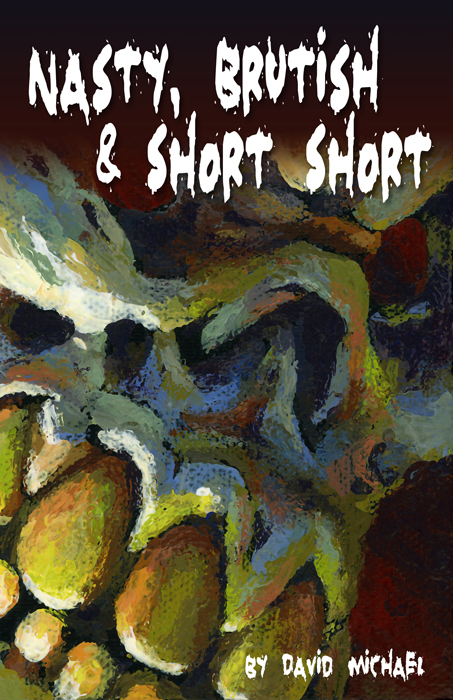 Nasty, Brutish & Short Short is a collection of just that sort of short stories that David has written over the years. He asked that we use my painting Ornery Streak for this cover and I was more than glad to accommodate. There are more of these in the works, including one I created a painting expressly for based on another of David’s photos. I will continue to show them off as they are released. Recently when I finished my self-portrait titled Prove It my friend CJ Boisvert told me that the blue in the face made her think of the blue light reflected from a computer monitor. I could immediately relate to what she was talking about. 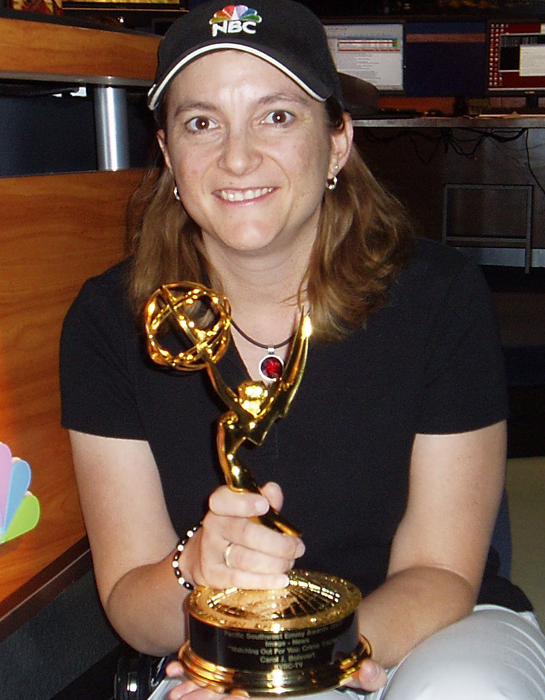 For several years we worked together in a Las Vegas television station. Almost daily she would stop by my office and this was the view she would usually walk into. In fact, CJ took this photo. (That little statue on the corner of the desk is an award we earned together and share with our good friend and former boss, Dale Wyman.) CJ was the Promotions Manager and I was the Art Director. As such, we were equals – each under Creative Services, but each managers of our own departments. As the years went by we became not only co-workers, but great friends. (My wife Laura even called CJ my ‘Work Wife’ – which really fits since no one knows me better -except Laura). Like me, CJ no longer works for the TV station we spent so many years – and so much blood, sweat and tears – with. Like me, CJ is now pursuing her dream. 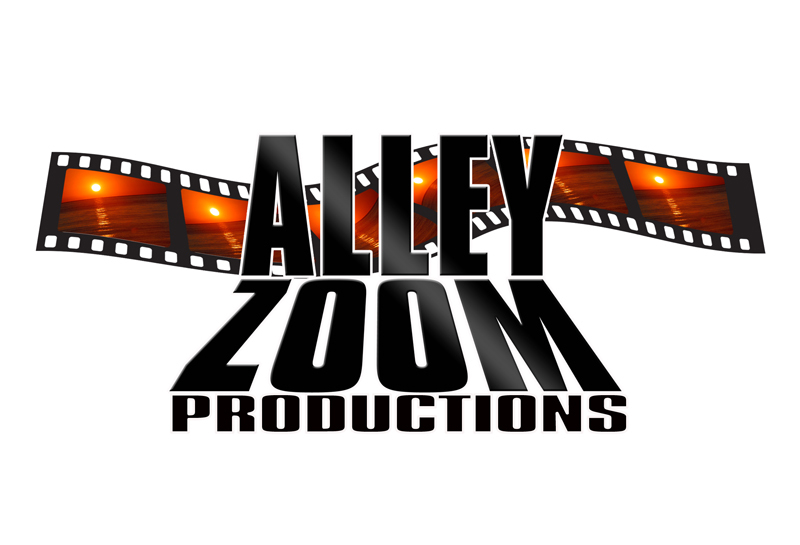 She has started up a production company called AlleyZoom Productions. Below you can see the logo we created together.